#TCTheater friends, do yourselves a favor and head on up to Osseo to see Yellow Tree Theatre's new original musical Flowers for the Room. 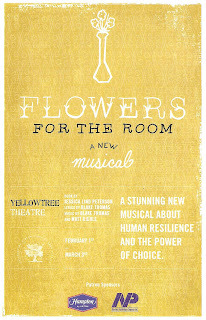 Combining the writing skills of Yellow Tree co-founder Jessica Lind Peterson (best known for her quirky and heart-warming Minnesota holiday plays) with the songwriting skills of Duluth-based musician Blake Thomas (one of my favorite local musicians - check out his music on iTunes and listen to his radio show Take It With You), Flowers for the Room is a truly beautiful new musical that gave me all the feels. Jessica and Blake are well-matched; both of their work has that quirky humor, but also tons of heart and a touch of melancholy. 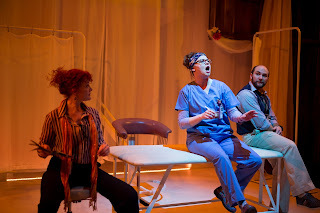 All of those elements are on display in this story of a woman who falls into a coma the night of her wedding, and how it affects her (because this is a musical, she still gets to talk and sing, even in a coma) and those around her. The stellar cast and innovative design bring this beautiful piece to life in a way I haven't yet been able to shake. We meet artist Allison and finance guy Jake on their wedding day, happy and excited to begin their new life together by hiking the Pacific Crest Trail and settling out west, where they plan to open some sort of hippie retreat. But those plans are cut short when Allison is seriously injured in a car accident. She's in a coma with crushed vertebra in her neck, and Jake has to figure out how to go on. He's mad at his brother, Pastor Greg, who was driving the car at the time of the accident, and reluctantly receives help from the friendly nurse and a wise social worker named Julie, who's a bit of a mess herself. But whilst people are talking to Allison in a coma, she appears awake to us in the audience, watching what happens, and talking to Julie in her limbo state (I was a bit confused if she was supposed to be another character, or what she was doing in Allison's subconscious). All five of these characters are grappling with the often difficult realities of life, and trying to find the light somewhere. I love that the ending is ambiguous, because a definitive outcome either way would have lessened the haunting effect of the story. Like Jake, we all move forward dealing with the uncertainty of life and trying to make the best choices we can each day with what we know and feel at the time. 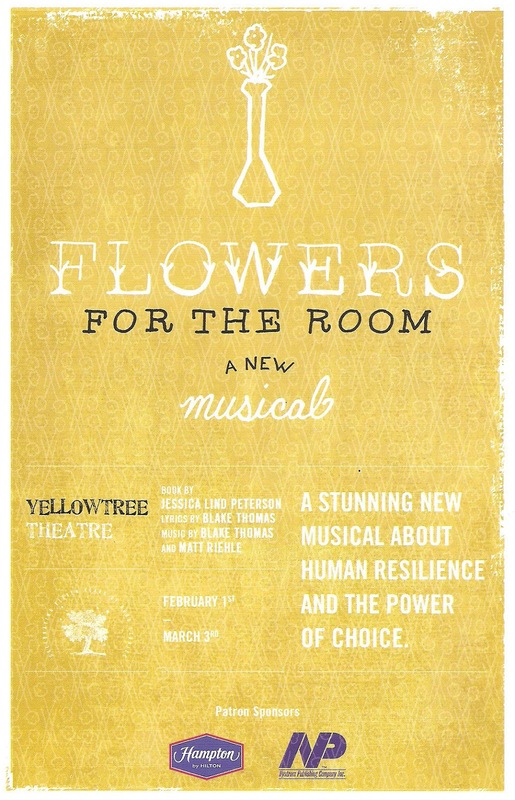 Flowers for the Room has a Next to Normal sort of feel (which Yellow Tree did a few years ago) - a musical dealing with pretty serious issues and heavy emotions, somehow easier to take in with music. I was also reminded of the song "Oklahoma Wind" by my favorite a capella group Tonic Sol-fa, about a man visiting his wife in a coma. It definitely evokes that same sort of sweetly sad feeling (listen to it here). 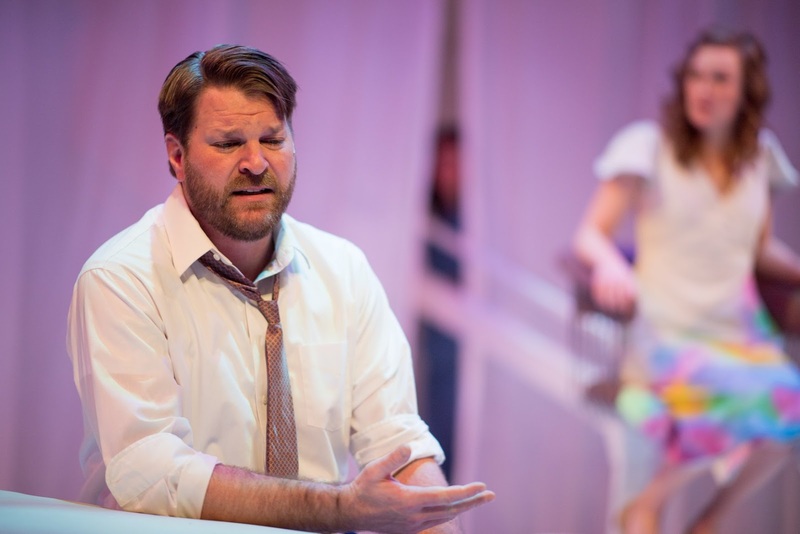 Jason Peterson, Yellow Tree's other co-founder, directs this wonderful cast and strikes the perfect balance between humor and melancholy. 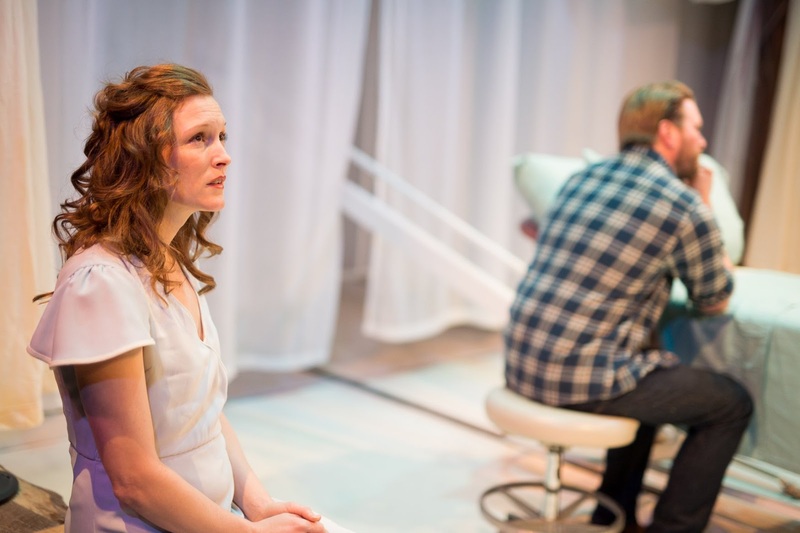 Playwright Jessica Lind Peterson plays the lead role herself, and is absolutely radiant as Allison, perfectly embodying that in-between space of hope, confusion, waiting, expectation. As her husband Jake, Zachary Stofer gives a heart-breaking performance (particularly impressive when you realize he does most of his emoting to an empty cot), conveying all of the anguish of the life Jake's found himself in. Even though Allison and Jake spend much of the show apart, we can still feel their connection. In the strong supporting cast, Daniel S. Hines brings a bit of humor as Pastor/wrestler Greg, but also pathos as he tries to support and reconnect with his brother. Kendall Anne Thompson sings as lovely as ever, and is a perfect embodiment of one of those angels on earth - nurses, although not without her own demons. Last but definitely not least, one of my #TCTheater faves Norah Long is just the best as Julie, even if we don't get to hear the full range of her gorgeous voice. In a lived in performance, her Julie is wry and honest and real. Music Director Matt Riehle leads the four-person band on keyboard, siting just off the stage. The band, which also includes composer/lyricist Blake Thomas on guitar, is introduced as the wedding band found on Craig's List, which allows them to be part of the show. In another clever feature of the play, characters occasionally talk to the band, and Matt and Blake make funny little quips back to them and to each other. The score has a sort of Americana sound, while still being very musical theater. I heard they have plans to record it and I hope to get my hands on a copy, because like all of Blake's music, it features unique lyrics that are both silly and profound, combined with music that tugs at all of the heartstrings. The new original musical (my favorite thing in the world) is a rare bird on Broadway, but fortunately it can still be found here in #TCTheater, no better example than this lovely creation by the team at Yellow Tree Theatre (continuing through March 3).